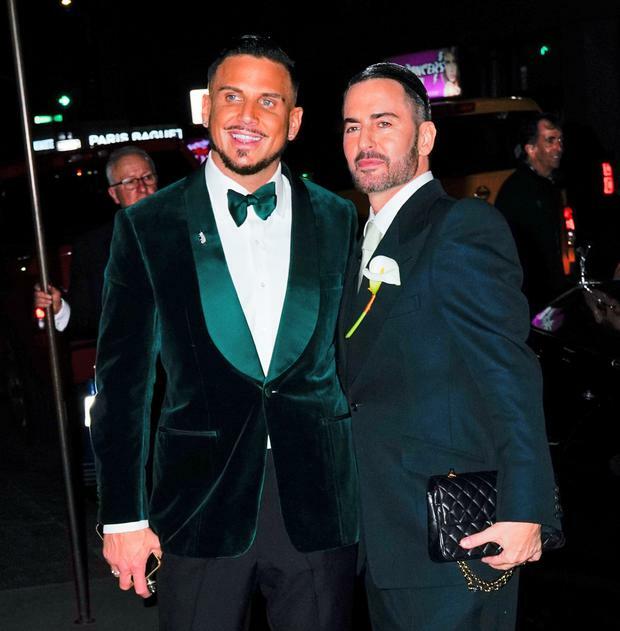 Fashion's A-list descended on New York City to honour the wedding of iconic designer Marc Jacobs and new husband Char Defrancesco. While the spring wedding season means the usual guest attire rules, there were no restrictions in dressing the part to celebrate the newlyweds' union on Saturday night. Marc and Char, who have been together for four years and the designer famously popped the question last April in a Chipotle restaurant complete with flash mob, exchanged vows at a still-unknown location and threw a star-studded reception at The Grill restaurant on Saturday night. Among the first to arrive was Kate Moss, in a high neck burgundy gown with velvet trim, arrived with her daughter Lila Grace Hack, in a gold mini-dress, while Naomi Campbell, in a sheer cape placed over her bandeau top and high waisted trouser combination. Supermodel sisters Gigi and Bella Hadid arrived hand in hand, with Bella showcasing her new much lighter - and longer - hairstyle, in all black and Gigi opted for vintage-inspired glamour with a flared suit, sheer body suit and velvet fedora hat. Singer Rita Ora also showcased her unique style, rocking Studio 54-style blonde curls and a printed strapless dress, while model Kaia Gerber was somewhat understated in comparison in a boxy suit. Emily Ratajkowski, a long-standing supporter of the designer both personally and professionally, wore a plunging silk yellow midi dress, as she arrived with husband Sebastian Bear McClaud. Jacobs arrived wearing a suit he designed, clutching a Chanel classic flap bag, while his new husband beamed in a green velvet tuxedo as they made their way to the party. Earlier this year, he spoke of joy at settling down with his candle maker partner, in particular moving from Manhattan to the suburbs. "I'm 55 years old, I'm getting married," Jacobs told WWD. "This feels like really a new chapter. I'd like to live a life outside. I just sit home and watch TV in the five-floor town house, you know? It's like, I'd like to be doing that with a beautiful view with dogs running around in the yard."